Close your eyes and think back to your favorite summertime memories... Imagine a beautiful warm sunny day, a picturesque picnic in a field, and the sweet taste of freshly-cut ripe watermelon. Cut into a ripe melon with every spray of Chemical Guys Fresh Slice Watermelon Air Freshener & Odor Eliminator! Fresh Slice replaces bad odors and musty smells with the savory scent of mouth-watering sweet watermelon. People love watermelon for its delicious sweet taste, soft savory texture, high vitamin content, and pleasant aroma. Only Fresh Slice Watermelon Air Freshener & Odor Eliminator captures the delicious essence of sweet watermelon fruit and the thick juicy rind for a fully fragrant watermelon experience. 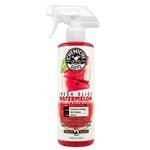 Fresh Slice Watermelon Air Freshener is more than a perfume, it 's an enzymatic odor eliminator. Use Fresh Slice in the car, home, office, motorhome, dorm room, gym locker, and anywhere else foul odors spoil the atmosphere. Permanently flush out musty odors and mildew from automobile AC systems and replace them with fresh watermelon scent. 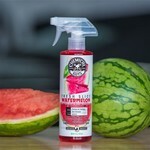 Every spray of Fresh Slice Watermelon Air Freshener & Odor Eliminator replaces bad odors with the scent of fresh and delicious watermelon, simpler times, and bright summer days. Eating a fruit like watermelon is all about the experience: Hoisting the chilled melon off the bottom refrigerator shelf, rinsing the large awkward oblong ball in the sink, placing it on the cutting board, sawing through the tough green skin and soft pink flesh, slicing neat wedges to hold on to or into tiny cubes to eat with a fork, eating around the seeds or spitting them out on the lawn, enjoying the warm summer day on the porch swing or under a shady tree… Slicing into the great green globe and cracking it open always fills the air with the fragrance of the sweet pink fruit, the bitter green skin, and white rind. Spray away foul odors and replace them with the essence of fresh watermelon with Chemical Guys Fresh Slice Watermelon Air Freshener & Odor Eliminator. Fresh Slice Watermelon Air Freshener is infused with the delicious scent of cool, crisp, juicy, freshly-cut watermelon. The non-toxic water-based formula is safe for use around the home and car, and will not stain carpet or upholstery. Clean the area to remove the bulk of dirt and odor-causing contaminants, then mist Fresh Slice over the surface to spread the odor-killing enzymes for maximum effectiveness. The fresh watermelon scent does not overpower, and lasts for weeks. 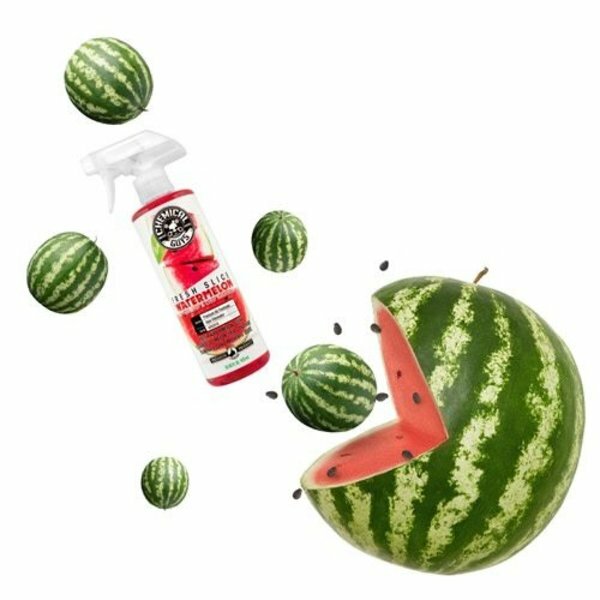 Destroy foul odors at their source and enjoy a crisp watermelon scent with Chemical Guys Fresh Slice Watermelon Air Freshener & Odor Eliminator. Chemical Guys blends air fresheners and odor eliminators with premium essential oils. Fresh Slice Watermelon Air Freshener is blended with special olfactory stimulants isolated from the sweetest and ripest fresh-cut watermelons. 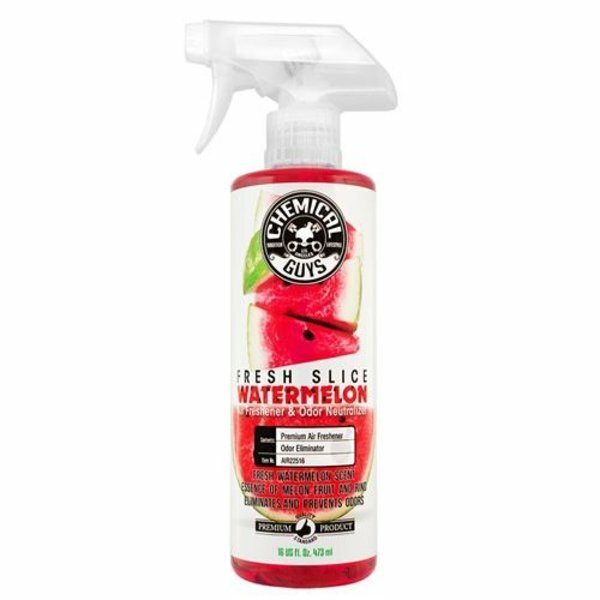 One spray of Fresh Slice destroys foul odors, freshens air, and leaves behind a crisp watermelon scent. 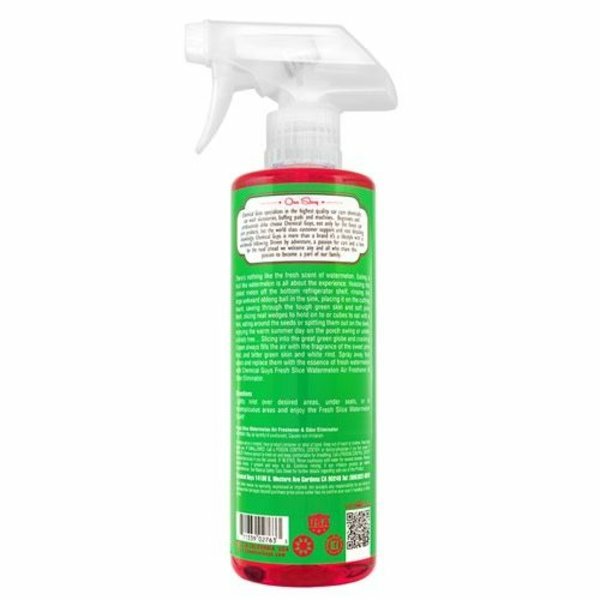 Fresh Slice Watermelon Air Freshener is used by professionals, automakers, OEMs, hotels, hospitality, management companies, homeowners, auto detailers, auto dealerships, janitorial companies, and house cleaners worldwide. Professionals understand the importance of the proper smell in its intended environment, and supplying their customers with a true new scent that lasts is why they turn to Chemical Guys Professional Products. Cars, boats, hotels, restaurants, outside, on carpets and upholstery, and more. Use anywhere that needs a fresh crisp scent. Fresh Slice Watermelon Premium Air Freshener & Odor Eliminator is available in 4 oz and 16 oz sizes.